Police in England have said the huge fire at a oil depot in Hertfordshire has been contained, but that it will not be extinguished for several more days. Two people were seriously injured in the blasts at the Buncefield depot, while dozens more suffered minor injuries. 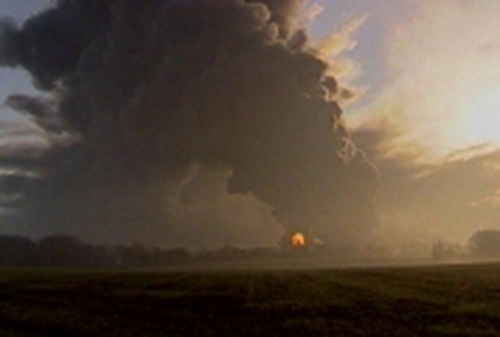 More explosions are still anticipated and at least 2000 people living in the area around the site have been evacuated. Police are keeping an open mind as to the cause of the blasts, although it is being treated as an accident. There is growing concern about the huge cloud from the terminal which is now engulfing a wide area. Residents living nearby have been advised to keep their windows and doors closed, because of the fumes. Emergency services say pipelines carrying fuel into the depot have been switched off, although millions of gallons of petrol remain stored there. The depot is located in an industrial estate, but the force of the blasts caused severe damage to a large number of houses.